We were young and had a future of hopes and dreams in front of us. We knew that life would have ups and downs, but never in our wildest dreams were we prepared for the news we would receive on August 3rd, 2003. God not only wanted me to be a witness to friends and extended family, he also wanted me to be a witness right inside my home to my husband and children. God has taught me two very important lessons in regards to being a stage IV breast cancer fighter and respecting my husband of 21 years. It can be very easy to get wrapped up in self when walking through an illness. As wives, we need to remember that we’re to fulfill our duties of honoring and respecting our husbands, regardless of the circumstances that are going on around us. We need to remember that we’re in a partnership, we’re not going at this solo. We have to learn to be “selfless” in respect to our husbands and think of his needs and not just our own. 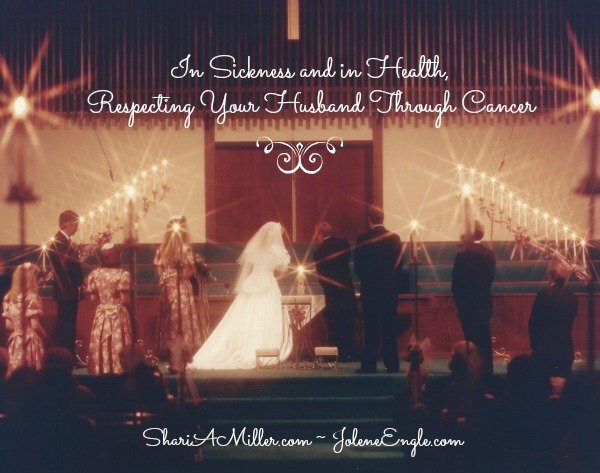 Take a moment to put yourself in your husband’s shoes when you are going through cancer, or any type of chronic illness and realize that they are walking on this journey right along with you. They have the fear of loosing their loved one. They have the same fears as you do of going to each and every doctor appointment, of awaiting the dreaded tests and scan results, and waiting to see which type of treatment will happen next. A very important thing I’ve learned about going through trials, which can be applied to any difficult situation that you and your husband face, is to put others first. Instead of focusing on how horrible my problem is, I try to focus on the needs of others around me, especially my husband’s. For me, doing this helps to take the sting out of the hurt to my soul, caused by the problems around me. When your in a similar situation, think about what you can do to ease your husband’s pain and suffering. Whether it be making his favorite meal, to texting him encouraging words throughout the day. Do things to make him feel better, remember that he is hurting just like you. Most importantly, ask him how you can pray for him throughout the day. Prayer can turn any situation around, there is power in prayer that can breath new life into every fiber of a persons being. The second lesson I learned about respecting my husband is to accept him for who he is. Cancer, chronic illness, or many other types of problems can bring about various challenges. When your destination of life gets changed and you and your husband have some bumpy roads to travel on, accept all your husband’s qualities, both good and some not so good. No one is perfect, he is only human, he is trying the best he can through these difficulties. Accept his decisions during these times. Support him, be his biggest cheerleader. A wife that tears her husband down, or belittles her husband’s decisions will be doing more harm than good. She will be bringing more turmoil to the situation and hurt her husband’s pride in doing so. For a man, hurting your husband’s pride is one of the worst things that you can do. Wives, we each have unique roles to fill in our marriages. No matter what were going through, let us live out those roles to the best of our abilities with the power of the Holy Spirit dwelling within us, pushing us forward to greater things in Christ’s name. Let’s take our eyes off of self and onto our husbands, encouraging, respecting, and loving them to be the men of God called them to be, no matter what the cost. Shari and her husband, Bill, have been married for 21 years and have two children who are their precious gifts from God. She is a housewife and a homeschooling mom. Her favorite things to do are, study God's word, and be at home taking care of her family. Shari is also a stage IV breast cancer survivor and lives each day striving to give God the glory for all that He has done in her life. You can find Shari blogging about leaving a Godly legacy, hope and encouragement in Jesus, and her life's journey at Leaving a Legacy. Thanks, Shari, for this excellent reminder. As a husband & wife, we definitely walk through these situations TOGETHER. I have personally been on both sides of “story”, so to speak. Although not with cancer, my first husband had a degenerative heart condition which took his life eventually. The Lord blessed me with a second husband. I am now the one with a couple debilitating health challenges (& recently the scare of cancer), & it affects everyone in the family. To be honest, in some ways it can be harder on the spouse of the person who is sick, especially if the disease is potentially terminal. I have found in our situation as well as in others I’ve spoken with, that the Lord seems to gives an extra measure of peace & strength to the person who is sick. So we need to extend that to our spouse who is struggling to carry on with normal duties as well as likely the extra things we can’t do + medical appointments, etc. God is good…. Thank you so much for stopping by today! Yes, you are so right, we always need to be thinking of our spouses when we are placed in these types of situations, giving them all the encouragement we can as we walk this journey together. Many blessings to you! What a great attitude for in sickness or in health! Right now my husband is beginning a journey/fight through a condition that if not treated could severely limit his mobility and strength. I know it is a scary thing for him, as it is for me. But, I think that continuing to encourage and respect will help him to stay positive, you know? I’ve also been thinking about what this journey will look like to our children and to those around us. Will they see two people who rely on God and work together? Or will they see two people who wallow in self-pity? I pray that it is the former! I agree that encouraging and respecting our husbands through the difficulty times, will always lighten the load and make the situations easier. As you walk this journey with your husband, I’ll be praying for healing and extra strength for both of you. Thanks for a good reminder not to fall into self-pity and negativity, even when we are going through difficult circumstances. Thank you so much for your kind words, and for stopping by today. Shari, thank you for sharing your empowering story. A youth leader told me the key to happiness is serving others. You stated the same thing here and I wholeheartedly agree. Our servant attitude makes all the difference in the many different trials. I’m glad it works in the trial of illness, too. Blessings and grace to you! I just love serving others. It helps to take our minds off of ourselves and onto others, and it brings such blessings in return. Thank you so much for stopping by. This really touched my heart, Shari. I can somewhat relate to this, because my husband was diagnosed with cardiomyopathy about 13 years ago and there isn’t a day that goes by that I don’t worry about the state of his health. He was told back then he would need a heart transplant and he had spent two weeks in ICU at the time of diagnosis. It’s been a scary road for us, but one where he has held very strong faith in God all along. He doesn’t worry about his health, but I always will, even with my faith in God. I will be praying for your husband’s health, as well as for you during this time. I know it can be so very hard. Remember that God is always with you, no matter what your situation. Turn to Him, lean into Him, when times get hard, He is just waiting for you to take His hand. Thank you Shari for this reminder. I shared this article with my mom as they are in their sixties with one illness after another but by God’s grace, nothing major! Thank you so much for sharing this. I’ll be praying for your parents. Blessings to you and your family! This is beautiful, Shari! At a time when most people would feel justified in being selfish, you are encouraging us to look beyond ourselves and look to serving others, where the joy is! My brother is also a cancer survivor. He has fought it three times and at one point, many years ago, they diagnosed him as terminal. He is currently back in remission, something they didn’t believe they could ever get him into again, and the doctor’s believe that he may be cured! I love how you remind us that God’s plan for us includes our abilities and illnesses and no matter what we’re going through, we can live out our roles as lovers and encouragers (etc.) to the best of our ability with God’s grace and help!